Netflix (NFLX) viewers got a hint of what was to happen when Starz-owned Sony movies disappeared from their Netflix queues in June. 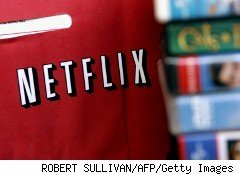 Now it's official: Starz (LSTZA) announced Thursday that it would no longer stream its movies on Netflix, ending a rocky agreement that began in 2008. Starz's sudden move to stop renegotiation talks could gut Netflix of Starz-owned Sony and Disney movies. The current agreement ends in February 2012. "This decision is a result of our strategy to protect the premium nature of our brand by preserving the appropriate pricing and packing of our exclusive and highly valuable content," Starz President and CEO Chris Albrecht said in a statement. Trouble has been brewing for a while. In late June, Starz asked Netflix to yank Sony films, including The Social Network and Salt. This was reportedly due to a clause that dictated if Netflix subscriptions grew past 22.8 million, Starz would have to renegotiate better terms for Sony in its contract with the studio, according to reports by Reuters and The Los Angeles Times. That, in turn, would compel Starz to ask for more money from Netflix. But Starz officially cut off contract talks, and it doesn't look like a Hollywood ending for Sony and Disney streamed content on Netflix.